Influx of PayPal phishes this morning, 30 so far, since 09:53. PayPal UK - Security Center ! YOUR ACCOUNT HAS BEEN TEMPORARILY LIMITED! Subject: [SPAM] YOUR ACCOUNT HAS BEEN TEMPORARILY LIMITED! 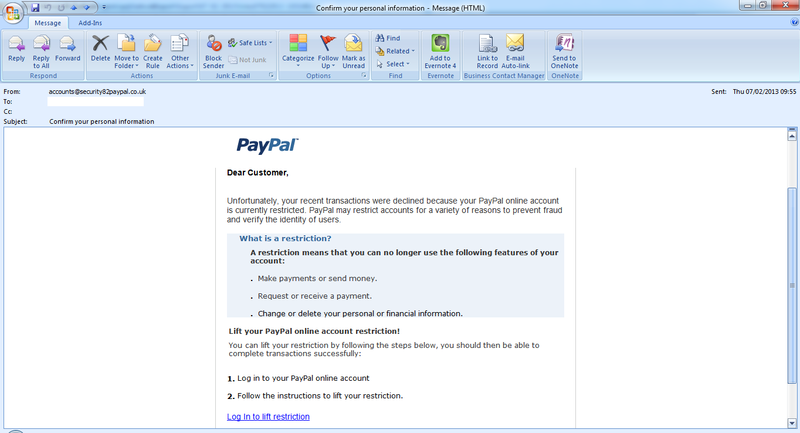 Subject: [SPAM] PayPal UK - Security Center ! As always folks, keep your eyes peeled, and ALWAYS (for those of you that still have HTML email enabled), HOVER OVER links before clicking them, to see where the links lead you. In the case of emails purporting to be from ebay, PayPal, banks and other sites you're registered for, NEVER click the links in emails, instead, type the sites address into the browsers address bar - saves you alot of risk.